Alzheimer’s Association Delaware Valley Chapter’s Diversity Outreach Program! 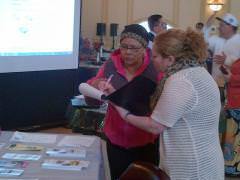 On January 22, 2014, the Delaware Valley Chapter of the Alzheimer’s Association conducted a diversity outreach program for the Latino population at The Centro Hispano Daniel Torres in Reading, PA. Age In Place Home Care partnered with The Berks County Area Agency on Aging to staff a table at the event. Age In Place Home Care’s Community Outreach Coordinator, Yolanda Mendoza had the interest of all in attendance as she gave a bi-lingual presentation of all its home care services and especially how Age In Place Home Care utilizes its specialized Dementia/Alzheimer Stimulation Program with people that are afflicted with this terrible disease. The event was well received with over 75 people in attendance.